Precious metal clay is one of my favorite materials to work with and these photos show the process. I'm really happy with how the collection turned out! Feel free to contact me with questions or pricing if you are interested in a specific piece or a custom design. PMC starts out in a form much Ike clay. Little particles of fine silver are held together with a binder. You can sculpt and carve as if clay. When PMC is heated to 1650 degrees the binder burns out leaving only the fine silver piece. Pretty fascinating! Some repairs to previously fired pieces and some new work going in the kiln. Just out of the kiln. After firing the pieces have a white powdery residue on them that will be brushed off. Powder brushed off to reveal fine silver. Rings have been oxidized and now will be polished to bring out design details. It was a pleasure to participate in Seattle's newest wedding event - I Do Sodo 2017! From the wedding planner to the honeymoon getaway 8 venues were packed with local vendors showcasing their talents. My wedding line, Fallen For You made it's public debut! Stationary - Anchored Paper Co.
Is your heirloom pin sitting in the jewelry box because you're afraid the mechanism won't stay closed and you don't want to risk losing it? I know I'd rather not lose my pin but it's a shame not to be able to wear it. If this is the case for you I have a trick to share! Go through the fabric once and then twist a rubber earring back onto the pin. Then push the pin through the fabric again and fasten. The rubber stopper will prevent the pin from falling off if it happens to come unfastened. You can find rubber earring stoppers at most craft and jewelry supply stores. I hope you find this helpful! Have a wonderful holiday! About 8 years ago the Viking was slated to be an antique adornment in a sewing machine shop's window. I couldn't bear to see this family heirloom suffer such a soft fate so I brought it home to live with us. I've used it now and then but recently decided to dust it off for good. It needed a makeover and it got a well deserved one! The sewing machine repair shop fixed it up and it runs like a well oiled machine - because it is. And I finally know how to adjust the tension and the mysterious buttons and knobs have been given purpose. The Viking now has a permanent spot in my jewelry studio and is at the ready to sew a Seahawks bandana for the pooch or a cozy blanket for a friend with cold feet. I feel so blessed to be able to practice yoga. Even if it is only once a week and occasionally in the backyard. It feels so good to breathe deep - in and out - feeling the air way down in my belly. The stretch in my joints and the deep, sweet strain in my muscles. If you can move and breathe consciously for even 5 minutes a day it will brighten the remaining 1,435! Even when you are sleeping. Trust me. I am constantly amazed at the colors and shapes of the flowers growing in my garden. Yes, I put them there so I had a little to do with the way they grow but there is so much left to the uniqueness of each bud, petal, stem and leaf. I could spend hours just sitting and observing. Nature is amazing! What bit of nature do you find fascinating? 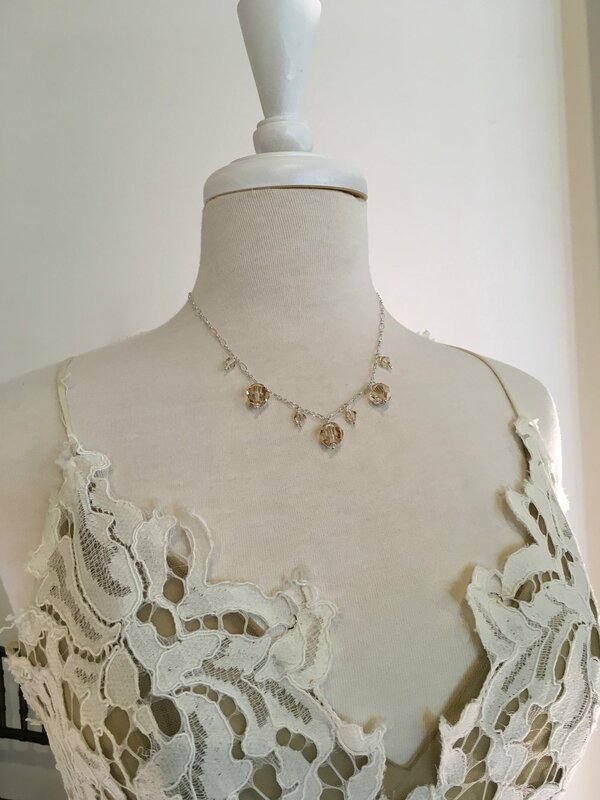 Fallen for You - A bridal collection from Jill Griffin Jewelry. Jewelry - check out Fallen for You! Jessica Earring - Fresh water pearl, Swarovski crystal and sterling silver. Vivian Necklace and Earring Set - Swarovski crystal and sterling silver. The timelessness of fresh water pearls, the exquisite sparkle of Swarovski crystal, the classic look of sterling silver. A bride deserves the very best in bling on her wedding day! Jessica Necklace - Fresh water pearl, Swarovski crystal and sterling silver. What is your wedding day jewelry bliss? When I was a little girl I loved to play with my Fischer-Price® castle. My favorite piece was the pink dragon. You know the one. As a child and now as an adult I am allured by the magical, mythical world that existed long ago. The world in which dragons roamed earth and sky, where knights fought for their kings and castle lands stretched out forever. It was not a surprise that I was immediately hooked on the HBO® series Game Of Thrones®. When I was in Tucson, AZ this February I found a stone that made me immediately think of the highly detailed, scaly, rough, and colorful hide that a dragon might have. A light went off in my head. I would create a collection of jewelry around this stone and bring to life the world of fantasy and myth. I'm excited to announce House Holloway! - a brand new collection now available from Jill Griffin Jewelry. Each piece represents a different female or male persona with the strength and determination to thrive in a time from long ago. Designing and developing this collection brought out a different part of my creative side that goes beyond my usual course in design. It has been a very rewarding experience and I am thrilled to share it with you! What is your favorite fantasy or mythological character? Holloway was my mother's maiden name, a strong family name with a lot of history. My mom was my hero and a huge inspiration throughout my life so it was the perfect fit for the title of my Spring 2016 collection, House Holloway. The Tucson Gem and Mineral show did not disappoint! I had a great time digging through mounds of pearls and gems and although the weather was unseasonably cold I was able to soak up a little bit of sunshine. Some of my favorites include this electroplated quartz which inspired the collection, House Holloway. Other notables were quartz crystal in a variety of shapes and sizes and fresh water pearls - fat, yummy round pearls in a variety of colors! Last summer on the shore of Rockford Bay in Lake Coeur d’ Laine, I found a rock shaped like an angel wing. I immediately thought of my mom who is always in my heart. The lake holds special meaning for me as I spent many a summer day on its shores in the good company of family and friends. When I was young my mom took my brothers, sister and I along with the two dogs and any other assortment of pets to my uncle’s house on the lake. It was a summer destination and I looked forward to it every year. Now as an adult I have the pleasure of visiting the lake each summer with my husband and get to spend time with my sister, her family and their, now ours too, friends. My brother in law's mother has a cabin right on the lake and it is a very special place. I wanted to share the wing and it's meaning with my family so I had it cast into a sterling silver charm. My hope is that the wing will represent something special to each person in his or her own way. Ok I know what everyone says, “Fruitcake? Isn’t that something you use for a door stop?” Most people have a negative connotation with fruitcake. My mom made fruitcake every year at Christmas and I have loved it since I was a little girl. The memories of the big Tupperware container filled with candied fruit swimming in booze are clear as day. It sat on top of the refrigerator for a week and to sneak a piece of that delicious fruit I’d need my big brother or a chair to reach it. I don’t remember the actual baking of the cakes just that when a slice was presented in front of me I couldn’t wait to devour it. Throughout my adult life there was always a foil wrapped piece of cake delivered at Christmas time. I would make it last 6 months or more. The best thing was I didn’t’ have to share it with anyone. The fall after my mom passed away I thought about the fruitcake. I had never made it with her nor did I remember anything about the process. My sister had made it with her once but couldn’t remember details. During a visit with my step father I rummaged in the pantry finding the old wood box filled with mom's recipes. I knew it had to be in there. Sure enough it was but not how I expected. I found a very old recipe card with Helen’s Candied Fruitcake written at the top. Below read the ingredient list and directions on what to add to what at different stages. A few of the lines were crossed out and portions rewritten in my mom's hand. “Pecans ½ #” off to the side and “use double recipe with 7-8# fruit”. “SOAK 1 wk” I made a photo copy of the card and took it home. I knew she bought the fruit from DeLaurenti in the Pike Place Market so I made a trip there to gather the ingredients. Not sure of the exact brand of booze she used I purchased a fifth of Jack Daniels and soaked the fruit for one week. The process of making the cake was pretty easy. I’m thankful I saw the note about draining the fruit before you cook it. The leftover booze soaked juice is used after the cake is cooked, poured over the top to make the cake moist. I made enough to share with my family at Christmas. All who love it were of course very grateful. The spouses who don’t eat it were grateful that I made my siblings happy. In the end I really don’t mind if people snub fruitcake. It just means there is more for me! What old family recipe do you hold dear? How is it November 13th already? Wasn’t it just summer? My dahlias are still hanging on but it's time to clean out the garden beds and prep them for next year. Sigh. I heard a program on NPR explaining why it seems like time goes faster the older we get. It’s because the more years we’ve circled the sun the more familiar we are with what happens in our lives. When we are young everything is new and we experience things for the first or second time. It is a time of discovery and seems to last forever, like summer when I was 10. The older we get the more the experience is the same over and over. We get to know it quite well and go through the motions as if a daily routine. It’s why the ride home goes faster than the ride getting there. We already know what we are going to see, just in reverse. Thinking about this reminds me to stop and watch the clouds form shapes in the sky. What is the coolest cloud shape you've seen? I like collecting older pieces of jewelry like Avon, Napier and Cartier. I find them at thrift shops and yard sales. Pieces that catch my eye and seem to tell a story. I have yet to discover a "Tiffany" piece but I know it's out there waiting for me to discover it. These pieces are representations of the past and a different way of life. Who was the woman wearing the necklace? Was she going to a holiday party or just having friends to the house for a cocktail and social hour? A lot of vintage pieces aren't made of precious metals or hold precious gemstones but they have a quality and a richness not found in jewelry today. What is the most exciting treasure you've found thrifting or at a yard sale? I was selling at an outdoor market last summer and a woman approached my booth. After looking at my jewelry for a minute she remarked, “I have so many pair of earrings.” We discussed how some pieces of jewelry should be treated like clothes. When you need to go through the pile and get rid of some you do. You give away what you aren’t using and then start over collecting more. It’s a great idea if you can follow through. Today I was thinking about this idea again and the permanence of things. How we get attached and hang on weather it be people, ideas or material things. What if a piece of jewelry wasn’t a permanent object? What if you could only keep it for an undetermined amount of time and enjoy it knowing it won’t last forever? What if I created some pieces with bits of nature? An object that may lose its color or stability over time. It may hold up longer than expected but go through some changes along the way. Each stage could be treated as a new piece or a new phase of the piece or the same piece with a different look and feel. So I did some experimenting with this idea. Starting with pine needles from a Bull Pine tree I made my first piece of jewelry using natural materials. This was a great piece of material for my first project because the pine needles were fresh and flexible. The first pair of earrings I wrapped silver wire around the needles and in between to hold the pieces together. The second pair I used the needles themselves as a lashing material and for the ear wires. Overall it was a satisfying exploration. The needles dried and faded as I had expected. What's an item you couldn't live without?